You are here: Home / News / Open Interviews Day at Spring Dell! WARNING!!! Working at Spring Dell may cause the following…. Making a difference in the lives of others. Making awesome new friends. Getting paid to learn. Opportunities for growth. More money in your pocket. Top of the line benefits. Lots of smiles. Inevitable joy! If you or someone you know is looking for a career with irreversible effects, this is the one for you!! Full Time, part time, day/night/weekend shifts available. Entry level through Director level! Please join us for our Winter Open Interview Day on Thursday, January 24th 2019 from 9am-2pm to find the job that is best for you! Grab your resume and come on over to 6040 Radio Station Road La Plata, MD! 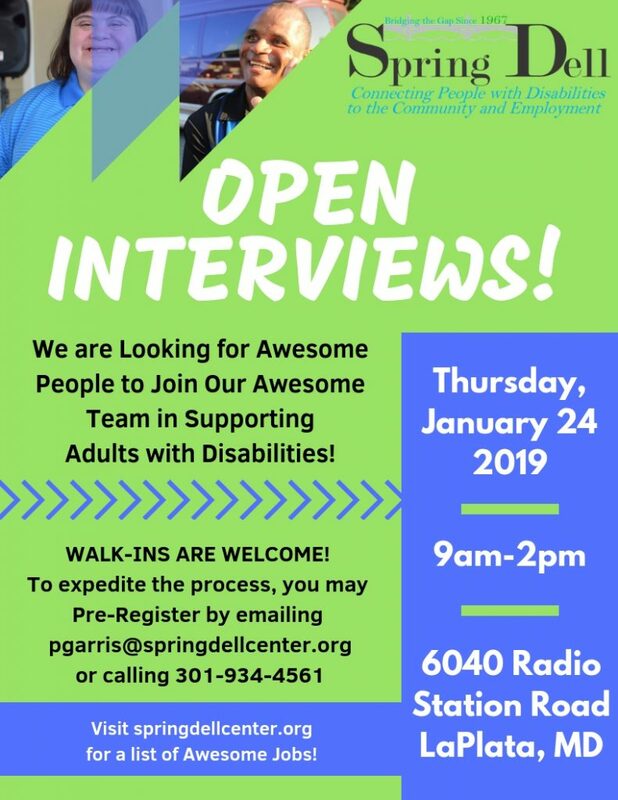 To reserve your interview slot please contact Paige Garris at pgarris@springdellcenter.org or 301-934-4561. Walk In’s are welcomed but reserving your slot saves you time! To view a complete listing of our available positions, salaries, benefits, etc. and to apply ahead of time online please visit the employment tab on our website: www.springdellcenter.org.